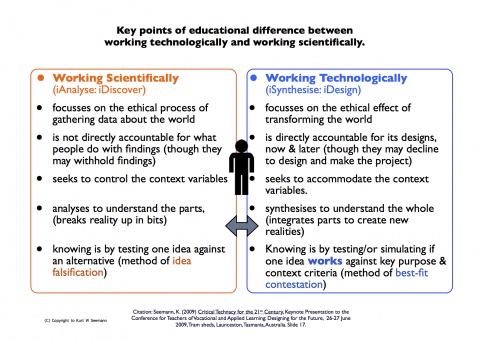 This slide is to be used as a discussion piece to critically examine key points of difference between working technologically and working scientifically. It acknowledges that there are many methods that these two fields of knowledge share in common. This slide opens debate to help identify the unique conditions for when students work technologically. Typically technological ideas (solutions) are validated through a design defence based on how well they have met a design brief. A good defence contests how well the solution "fits" BOTH the selected or assumed context parameters as well as the intended place conditions, enduser and purpose of application. The defence of the final design, is often through contesting a technology's Best-fit for meeting a design brief and end user context parameters. The slide supports the view that individiuals also draw on many other fields of knowledge in the course of a project (such as from the Arts, Math, Language, Music etc).